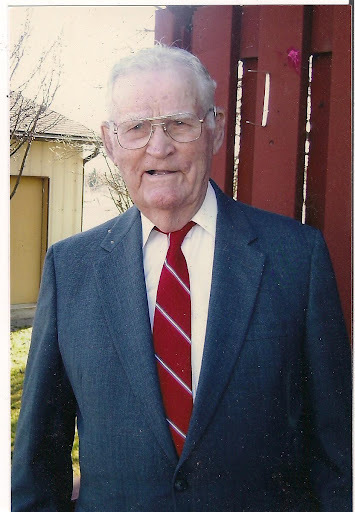 This October, my wife Kristin’s grandpa, James Milton Nelson, turned 100 years old. Man, that is a long time to live here on God’s green earth! Since I married Kris, I have developed a great love and respect for this hardworking, good-hearted man. Even at his age, he is still bright-eyed and alert with a memory like an elephant. J. Milton Nelson: The man had swag even in his youth. When I first married into the family in the mid-90’s, I knew that Grandpa is a diehard bass and crappie fisherman from Texas. 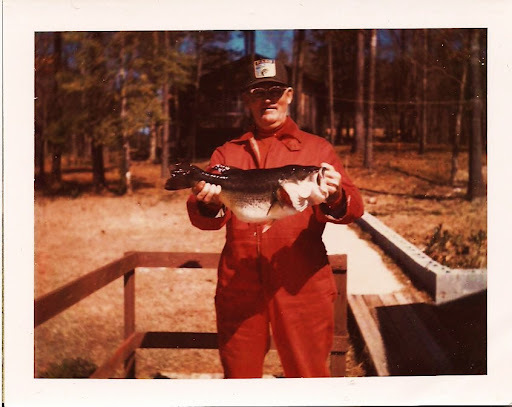 Like Grandpa, I love to fish and I have often admired the monstrous seven pound bass from Toledo Bend Reservoir that hangs on his wall which he caught with a top-water jerk bait. Can you imagine? That had to be like an agro-peacock bass attack! 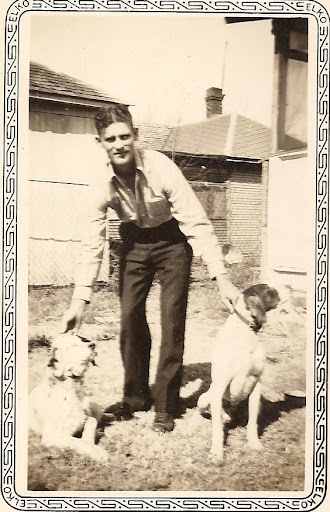 I have since learned that Grandpa was also a Southern bird hunter (which means quail in the south) with a raw-boned English Pointer named Dan and a Llewellyn Setter named, Cola (pronouced Kolee). I have spent many afternoons listening to Grandpa relate stories of helping Dan to get over his hard mouth (which he learned from retrieving a vicious wounded squirrel), of breaking his setter of being gunshy by rowing him out in a boat and firing away, of five covey days, or of hiding in the cut kaffir corn shocks to pass shoot Oklahoma prairie chickens as they came to feed, some so close he could almost reach out and grab them. Prairie Chickens in the cut kaffir corn fields. 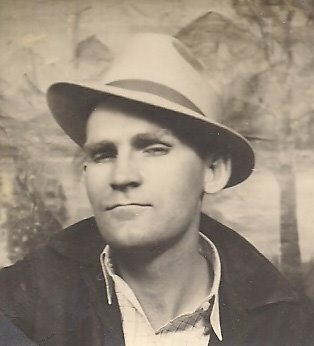 One of my favorite of Grandpa’s stories is of the time he and a few others hunted an abandoned homestead on the Oklahoma Kansas line. The dogs soon went on point in a plum thicket, instead of flushing bobwhites as Grandpa expected, gigantic guinea fowl erupted and Grandpa and his companions had a field day chasing and shooting this foreign African gamebird. 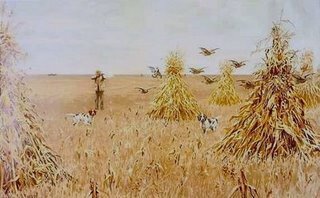 I have often wished that I could go back in time and spend just one day afield with Grandpa, Dan and Cola hunting bobwhite quail in the sprawling soybean fields of the South, or that he could come with me and my dogs to hunt sharptails. What fun we could have! 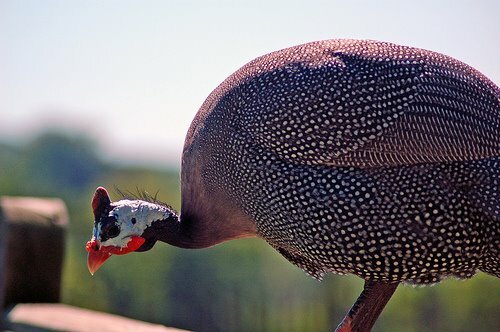 African Guinea Fowl: Grandpa’s unexpected, but welcomed gamebird. In preparation for his centential celebration, my wife prepared a biography of her Grandpa’s prosperous and eventful life. I felt that it was important to record Grandpa Nelsons’ sporting adventures because this is such an important part of his life and mine. Since I had already heard most of his stories, I conducted the interview and Kristin took notes. Towards the end of the interview, I asked Grandpa if there was any day of bird hunting that really stands out for him more than the rest. For me, his profound reply in his deep southern accent really resonated: “Andy, I loved everyday I spent hunting with my dogs whether we got birds or not. Every single day was special. I wouldn’t trade a one of ’em.” My friends, may each of us never take for granted one single day afield the Lord has given us! As I have said before, every day is a gift from our Creator. I am so greatful for the wonderful heritage from Grandpa Nelson that I can pass down to my kids.